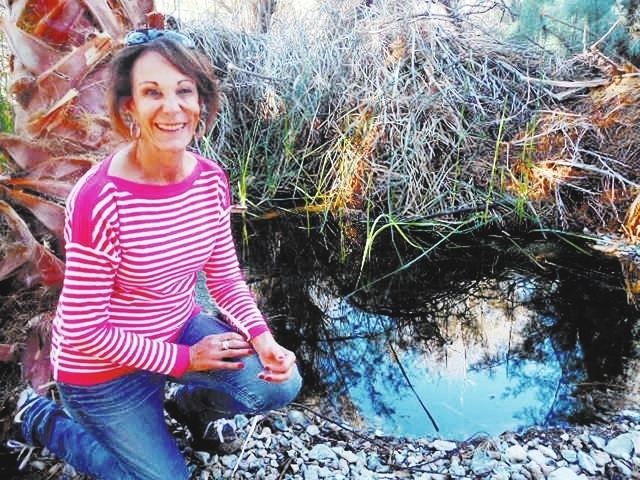 SHOSHONE, Calif. — Even with heavy cakes of mud on her shoes, Susan Sorrells moves lightly through the tangled brush, making her way to the secret place where the pupfish swim. She has sheltered them, protected them, nurtured them for nearly 30 years and still looks upon them with delight. And the Shoshone pupfish, unlike their more famous Devil’s Hole cousins, who continue to hover on the brink of extinction, are thriving under her watchful eye. So much so that there is now a small population of them available for public viewing. The Shoshone pupfish story is one of growth and prosperity, but it wasn’t always so. Like their Devil’s Hole counterparts, back in the 1930s the Shoshone species began to dwindle. By the late 1960s they seemed to have disappeared altogether, leading scientists to conclude that the species had gone extinct. But the tiny pupfish (average size about 2 inches), in all its variations from Death Valley to Mexico, is something of an enigma to scientists and conservationists, sometimes morphing to suit its environment and turning up where it’s least expected. In fact, says Sorrells, the pupfish that swim in the Shoshone stream today are believed to be a resurrection of the extinct species, but “we simply don’t know for sure.” A study done in 1986 by a researcher who was surprised to discover a small population of pupfish in a drainage ditch, indicated that they were the most like the extinct Cyprinodon nevadensis Shoshone, and argued for the resurrection of that species. Most likely, the study reports, the fish ‘maintained a small population in Shoshone waters, but remained undetected’. “But they could also be Amargosa pupfish,” Sorrells explains. The Amarosa pupfish is a separate species that was also once abundant in the region, but is now eluding researches who want to study and compare it to the Shoshone variety. Either way, Sorrells says, protecting them was important enough to her and to organizations such as the California Department of Fish and Wildlife, the Bureau of Land Management and the Desert Fishes Council, that a collaborative effort over the past 20 years has resulted in bringing a population of 70 fish, captured in 1986, to well over a thousand today. But “not a moment too soon,” Sorrells says, funding was awarded for a habitat expansion project through the Desert Fish Habitat Partnership. This resulted in the creation of three new pools as backups to the original refugium. This includes a publicly accessible pool that makes general viewing of the Shoshone pupfish possible for the first time. Across the road from the pupfish viewing pond, construction is also underway on a bird refuge, a large pond set to be filled by spring 2014. Sorrells hopes to attract and protect native and migratory birds and wildlife. 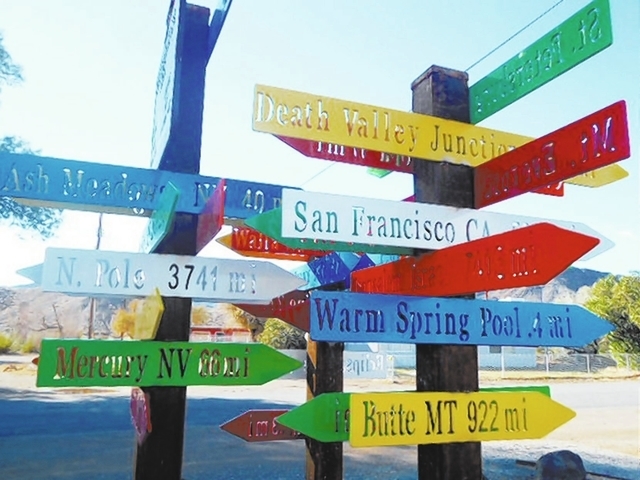 And the inauguration of the new Bud and Betty Feldkamp, Jr., park in the center of town this fall created a space for visitors to rest, have a picnic, and contemplate a collection of colorful direction signs which tell the distance to such destinations as Pahrump, Badwater, and the North Pole. A lot has changed in the years since Sorrells roamed Shoshone as a child and came to know the plants and animals as friends. What was once an easy coexistence now requires ever more vigilance on her part and that of her conservation partners to accomplish the delicate balance of humans and wildlife. “But I have to believe we can do that, that we can steward one another,” she says. Tramping through the underbrush and talking about conservation, Sorrells has been serious and rather businesslike. And then, down on her knees in the water at the pond’s edge, the no-nonsense demeanor fades and she smiles at the pupfish as one does at an old friend. There are many reasons why protecting the pupfish is important — preserving a species from extinction, reclaiming the natural habitat of the land she loves, contributing to the pool of knowledge about the mysterious pupfish, are all important. And, just as central, “Nature enhances your enjoyment of life,” she says.